or your reference, probably the closest town to the starting point is the town of Leonia New Jersey. An online interactive map to Leonia is available through MapQuest and will help you locate the starting point (or general vicinity) of this motorcycle road. Look for the star in the middle of the map. Photo contributed by visitor in Jun 09 - "West Point seen from Garrison Landing on 9-D going toward Cold Spring." on October 15, 2010 4 out of 4 members found this review useful. I was a passenger behind my Dad during a Suicide Prevention Poker run yesterday and we took this route. It was the most beautiful ride that I have ever taken. Kudos to East Side Bar & Grill for choosing the route. on September 10, 2014 1 out of 2 members found this review useful. I live in the area so I am quite familiar with the roads here. Seems like a great route! Would definitely be gorgeous in the fall. If i had to make a suggestion, i would skip the bear mountain bridge and keep heading north on 9D. After crossing the bride at 84 i would come right back down on 9D. The scenery is incredible all the way down and is a much more stimulating ride than 87 would be. my 2 cents! i will try this out soon. on April 1, 2011 1 out of 3 members found this review useful. My wife, son, and myself took a similar route. Starting in North Jersey we take Rt 17 to Rt 6 into Harriman. Turn off onto RT 293 north. Turn onto 9W to Newburg Bridge, cross and head south on 9D to Bear Mtn Bridge. Cross that that and take 9w south back into NJ and home. On weekend mornings its a beautiful ride and scenery is nice in the fall. 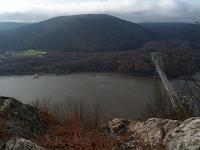 View is great on 9W north at top of Storm King Mtn. on June 8, 2008 1 out of 3 members found this review useful. Stick to 9w all the way up instead of the palisades. Palisades is a horrible road and 9w will keep you along the river. Should take a diversion up to perkins as well. on September 14, 2009 0 out of 2 members found this review useful. Clicking on Seven Lakes drive and perkins memorial drive gives way point errors. Can you still get to perkins?